Posted: Tuesday, May 19, 2015. 2:52 pm CST. 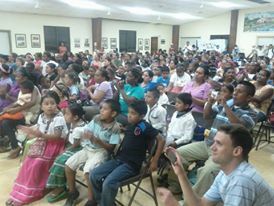 Tuesday, May 19th, 2015: BMG: The Festival of Arts Golden Night, sponsored by the Ministry of Education, Youth and Sports and the National Institute of Culture and History (NICH), packed the Punta Gorda Parish Hall to capacity last night with over 300 in attendance. 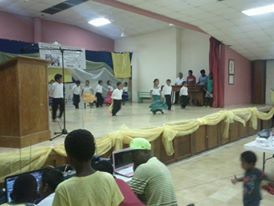 This event, which featured winning Primary School acts from across the Toledo District, saw 20 performances hitting the stage, all vying for a chance to represent PG at the National show in Belize City on Thursday May 21st. There, the best displays from each district will take the stage once more in hopes of winning it all and taking home trophies to their school. The 9 winners chosen last night, whose pursuit of the National title continues, came from Pueblo Viejo Village, St. Peter Claver R.C School, St. Benedict R.C School, Little Flower R.C School, San Felipe Village and Barranco Village, some schools with more than one items qualifying. These groups or individuals each received a trophy and will be travelling along with their teachers to Belize City on Thursday.